Sundae is a popular street food in North Korea and South Korea. 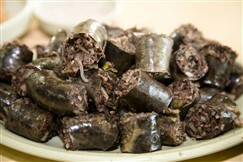 It is made by boiling or steaming pig or cow’s intestines that have been stuffed with various ingredients. Sundae has been featured on various weird food lists and is considered a highly unusual food by most foreigners. It is favoured by most Koreans as a snack to be eaten between meals. The dish may have originated from the Goryeo region and was written about in 19thcentury Joseon cookbooks such as Siuijeonseo. The most common way of making sundae is to stuff pig’s intestines with barley, dangmyeon noodles and pig’s blood. The intestines can also be stuffed with rice, beans sprout, green vegetables, garlic, ginger and sesame oil. Doenjang or ganjang can also be added to the mix. 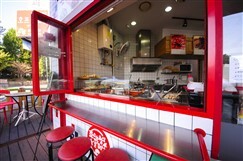 Sundae can also be made with seafood such as squid (ojing-eo sundae) and Alaska Pollock (myeongtae sundae). Sundae is also usually used to make dishes such as sundae-bokkeum, and sundae-gukbap. Sundae is usually served with tteokbokki. 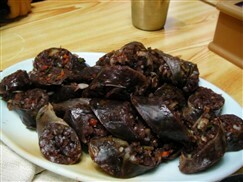 I don't like blood sausage in any country, so it's no surprise that the Korean version doesn't do much for me. The squid one is pretty to look at, especially when it's a whole squid! However, the taste leaves much to be desired.